It seems to happen to me every year at this time - winter burnout. Spring is almost here (well, in a couple of months) and my body and brain just seem to get together and say, "We're done for a while. Let's crawl back into bed and hibernate." Or, I get sick. Or both! I am super tired at the moment in almost every way. I have tons of grand ideas but am having trouble implementing them. I have been battling a sinus infection for months now and finally went in and got antibiotics last week. I am almost done with them and am already noticing an improvement. I am trying to do one more thing everyday than I did before, even if it is a minuscule little thing. The other day we learned where 3 towns were on a map, learned about why day/night happen the way they do, talked about seasons, and drew pictures of the weather lately. (Sunny, incredibly cold, and with blinding white snow in the background if you were curious!) Yesterday I was not feeling so great so the kids watched WAY more TV than they usually would - mostly Magic School Bus episodes. We started reading Dr. Dolittle at bedtime. I did some knitting. Nothing epic, just the day to day. And I've decided that is fine for now. It's all I can manage. I'm guessing it takes a while to recover from burnout. Oh, did I mention there are 3 kids birthdays in 3 weeks? Yeah... I enjoy putting on birthday parties for the kids but am struggling to find the energy again this year. Other years we've actually had to put off the parties until a month or two down the line as we have all been sick over the birthdays themselves. 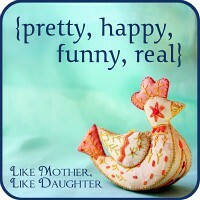 Celebrating everyday contentment with the ladies at Like Mother, Like Daughter! This is a pretty accurate represenation of our house a lot of the time - pile of clean laundry on the couch, play dough scattered across the table, the two year old with her face covered in yogurt, and a bin or box of miscellaneous things waiting to be put away. See that bit of wreath in the bottom right corner? Yeah, that is in one of those miscellaneous bins of stuff to be put away. I bent over to pick something up off the floor and somehow didn't see the long plastic pine needles that were sticking straight up and managed to poke myself right in the eyeball with one. Ow. Not recommended. I didn't even have a chance to blink. My brain only registered the bulkier part of the wreath not the spiny sticking out bit! That got moved in a hurry. Thankfully, no real damage done. I seem to specialize in slightly weird ways of injurying one's self though. :P I should have been wearing those safety glasses Emma has on! The kind of paperwork I'd rather be doing - drawing with Riley in the woods. Ugh. I don't know why I have such an issue dealing with paperwork. The bills get paid on time and important correspondence is attended to, it's just the filing part afterward that I seem to have a problem with. I have stacks of paper. I have boxes filled with stacks of paper. I even have boxes filled with filed papers. Most of it is probably no longer relevant or more valuable than firestarter. However, I can't actually know that until I look at each paper, file, and box. Sigh. Time to get it done. I have been sorting and throwing away papers a bit this week and have been amazed at the energy returning to me. I'm not sure if it is the dealing with the papers themselves that is so freeing or that I am finally acting on that which has been nagging me for so long. In any case, the resulting feelings are good ones. Well, last night was probably the best sleep I've had in several weeks. Emma has been teething lately and so I've been woken up frequently at night while those slow moving chompers came in. My "best sleep" probably isn't what many of you would think of - it wasn't perfectly silent, it wasn't uninterupted, and it wasn't a marathon snooze, but it was gooo-ood. Yes, you know you're a little sleep deprived when children talking in their sleep, babies waking you to nurse, strange and fascinating dreams, and a wood-weevil crawling on you and later, biting your face (miserable things creep out of the firewood every now and then) constitute a good sleep. On another sleep related note - we ordered a new mattress yesterday. I might feel completely human by the end of November. Lovely!